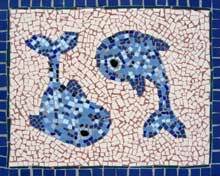 Grout is generally mixed with water to produce a mud-like consistency; it must not be too sloppy nor too stiff. 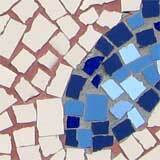 If the grout is too stiff you risk pulling off little pieces of tesserae that have not been glued on properly. Don't worry about these pieces, as generally the grout will act as a second adhesive and set them firmly in place. You will generally have one or two loose pieces in each mosaic. You should then press the grout into the tiles using your fingers or a tiler's sponge or squeegee. It is important that you have more than enough grout as often it is hard to tell how much you will need, so always make a little more than a little less, especially if you are mixing color into it. 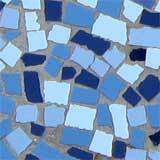 Be careful because if you don't have enough grout you will have to make some more up and if you are unable to get the exact same color as before it can change the aesthetics of the mosaic. If you are using a plain white, beige or grey grout powder from a packet then you have a little more leeway when making it up as you will produce the same color grout every time..
Once you think that there is enough grout between all the tesserae (try to go over the piece slowly and pushing your finger into gaps to make sure there is enough there) scrap off the excess grout with a grout scraper and throw it away. There will still be a fair amount of grout over the top of the tesserae, don't worry about it, get a dry towel and wipe off as much as you can without disrupting the grout. Leave the mosaic for half and hour or until the grout is firm and dry. Then get a wet towel and wipe the mosaic over until pretty much all the grout has been removed from the top of the tiles. Be very careful not to dig up the grout as often it is still a little damp and the moisture from the wet rag can loosen the grout. Once you have done that take a dry soft cloth to buff the surface of the mosaic pieces. By this stage you should have very little grout on the tiles and your main job is to polish the tesserae, remove any minor residue and just clean everything up. 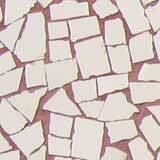 Read more about tile grout for mosaics.